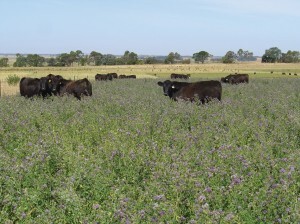 Site focus: To try summer and winter active fescues and lucerne in the right soil types to maximise beef production and manage pugging in waterlogged soils. Soils on the farm: Grey loam over buckshot clay and black cracking clay. Summer-active tall fescues have been more successful than perennial ryegrass in low-lying wet areas, but the challenge is to find a legume that will establish and co-exist with the fescue. The inclusion of legumes with perennial grasses is important for pasture growth (to address nitrogen deficiency) and feed quality. Persistent pastures are vital to managing climate variability, but special purpose pastures, such as lucerne, also have a role for providing quality out-of-season (summer) feed for finishing stock. The effect of drought and climate variability prompted John and Maureen Fish to look for more resilient and productive pasture systems for their grazing operation at Mt Wallace, south west Victoria. Hosting an EverGraze Supporting Site has given them first-hand experience in how perennial species, such as tall fescue, perform and persist under a range of landscape challenges on their property. “We have experienced considerable climate variability during recent years — our long-term average rainfall is 600 mm per year but recently it has been closer to 450 mm with an increased amount of out-of-season rainfall,” John explained. to trial new winter-active tall fescues and lucerne in this environment. ‘We were interested in following up the EverGraze philosophy of putting the right pastures in the right place across the landscape for the right purpose and with the right management,” Neil said. Site 1 (summer-active fescue) had black cracking clay soil and was predominately bent grass pasture. According to John’s records, clover struggled to persist in the low-lying paddock due to long periods of waterlogging and as a result perennial grasses often appeared nitrogen deficient. 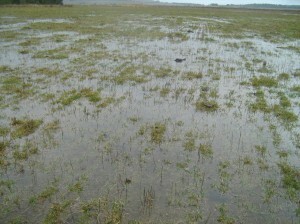 The paddock was also prone to pugging, which limited winter grazing capabilities. Site 2 (winter-active fescue) was on top of a slight rise and featured grey basalt over a buckshot loam. The pastures were also predominately bent grass and ryegrass. In this paddock we were after a competitive, persistent and productive pasture to ensure winter livestock production. At the start of the trial phalaris struggled to persist at this site due to low pH and high aluminium levels. Both sites were sprayed with broadleaf and grass weed herbicides and direct drilled during May 2009. Site 1 was sown with 12 kg/ha of summer-active fescue (Quantum XP2) and 8 kg/ha of a sub-clover mix (Leura and Trikkala). Site 2 was sown with 12 kg/ha of winter-active tall fescue (Flecha) and a sub-clover mix (Leura and Trikkala). Both paddocks received 100 kg/ha monoammonium phosphate (MAP) fertiliser at sowing and were rotationally grazed on a time-based system — close to two weeks on and six weeks off with 70% ground cover targeted to lower the risk of soil erosion and weed invasion. According to Neil, the wet seasons experienced during the three years of monitoring resulted in strong pasture establishment and growth. This made it difficult to estimate the relative productivity increases achieved by sowing these perennial pastures (see figure 1). “However, the seasons provided ideal conditions to test the performance of summer-active fescues on the low-lying clay soils on Site 1,” Neil said. During the monitoring period, John noticed that the cattle didn’t seem to like the summer-active fescue and despite ample feed, they headed for the gate not long after going into the paddock. “This is most likely due to under-grazing over late winter-early spring grazing (due to water-logging) and the resulting poorer feed quality and low clover content,” John said. According to Site Co-ordinator Neil James, the winter-active fescue on Site 2 has provided excellent production and has so far persisted well. “The plants increased in size and tillered well during the demonstration. Stocking rates averaged 15 DSE/ha throughout the demonstration. 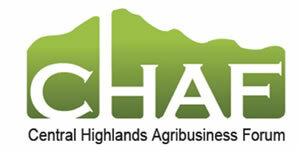 Between January and June 2012 they averaged 13DSE/ha,” Neil said. Ground cover throughout the winter-active site remained high, at 98%, but clover content during autumn–early winter declined between 2011 (24% April) and 2012 (11% June). John Fish thought this may be seasonally related. John also sowed lucerne in 2009, adjacent to the EverGraze Supporting Site as part of a MLA Producer Demonstration site (PDS). The demonstration investigated the ability of lucerne to capture summer rain and provide high-value feed for finishing cattle outside of the growing season. Stamina GT6 lucerne was sown at 14 kg/ha together with 0.3 kg/ ha of Porto cocksfoot and 0.3 kg/ha of Holdfast phalaris, in an eight-paddock system so it could be rotationally grazed. According to John, the site was not ideal for lucerne, but was representative of common soil types in the district with a soil pH of 4.8–4.9. For John and Maureen, the EverGraze Supporting Site has demonstrated the potential of both winter-active and summer-active fescues, phalaris and lucerne pastures on their country. Modelling at Hamilton EverGraze research site showed that including 25% winter active lucerne in the farm system was more profitable than a ryegrass system. EverGraze originally set out to design farming systems, based on perennials, which substantially increased profit from livestock production while reducing ground water recharge. The project successfully demonstrated that this could be achieved by applying a basic principle – put the ‘Right Plant in the Right Place for the Right Purpose with the Right Management’. Most farms in south west Victoria have soils that vary from being well-drained on the crests to waterlogged across the valley floors. To date there had been little attempt to use this variability to advantage. 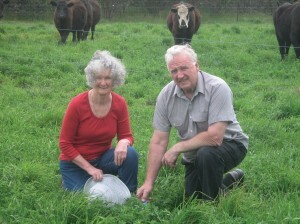 After seeing what could be achieved by applying the EverGraze principle at the Hamilton Proof Site, John Fish was motivated to look at pasture species for both the waterlogged parts of the farm that would also add value to his beef enterprise and spread the risk from relying on one (perennial ryegrass) pasture species. Summer-active tall fescues are well suited to low-lying, heavy soils with a high water holding potential. Being summer active, this fescue needs moisture (through rain or retained soil moisture) during summer to achieve its growth potential, as it will respond and grow well during summer and spring, but less during winter and autumn, particularly in cold conditions. The tall fescues have deeper root systems than perennial ryegrass or cocksfoot and the summer-active varieties have a higher root density at depth than the winter-active types. This deeper root system allows them to access stored soil moisture and grow when seasons dry off and other species are dormant. When established, the summer-active fescues can reduce pugging of the soil in winter. So far John’s summer-active fescue has persisted well and coped with long periods of waterlogging during the past two years post establishment. However, as John has identified, the wet years following establishment have made grazing during spring difficult and reduced the quality of the feed as well as clover content. At the Hamilton EverGraze Proof Site, it was shown that managing tall fescue by set stocking with sheep in early spring helped to retain feed quality and promote sub-clover persistence. Where this is not possible (due to pugging from cattle), it may be necessary to cut the fescue for hay. 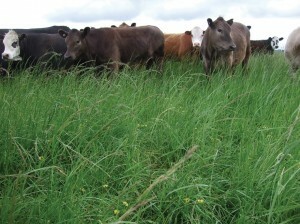 To balance the feed demand for the beef enterprise over the year, other pasture species are needed for higher, less-waterlogged soils, which also provide feed during winter. While perennial ryegrass has performed well in this environment, much of it was wiped out with drought. The winter-active fescues offer potentially better persistence than both the perennial ryegrass and the summer-active fescues. They are more suited to drier environments and are dormant during summer, providing growth over autumn, winter and spring. Phalaris is another suitable option for soil types not affected by high aluminium levels. Pasture species with quite different environmental (soil and moisture) requirements and consequent growth habits offer potential for adapting to the soil type variation as well as spreading out the feed growth across the year. As John has discovered, lucerne could provide opportunities for growing out the spring born calves to heavier weights rather than selling at weaning, leading to more kilograms of beef produced per hectare, without increasing supplementary feeding or reducing cow numbers. Incorporating lucerne into a beef system has its challenges and requires new skills, such as managing bloat, pugging or heavy trampling. Time will tell how well lucerne fits into John’s enterprise. A case study modelling exercise by Lisa Warn (Mackinnon Project) for EverGraze, indicated that, in the Hamilton environment, including 25% winter-active lucerne in a perennial ryegrass pasture system was of most value for a beef self-replacing enterprise (in this case July calving and calves sold during February at 19 months of age). This was primarily due to the high demand for quality feed for cows and calves during summer and so lucerne reduced the need for feeding in this period with most advantage in the dry years.